That is why we are posting #ThrowbackThursday via the @rollcall Twitter feed each week. Follow along here ! In case you missed last week&apos;s edition, here it is. Hillary Rodham Clinton has a long history in Washington, D.C., — though not as long as Roll Call! With Sunday&apos;s announcement she&apos;s running for president, she might be back in the District soon. With that in mind, here&apos;s a look back at a few moments when the former senator appeared on Roll Call&apos;s pages. Hint: All of the answers are the same this week. Q: Who made the Roll Call trivia quiz in 2001 because of her bright blue suit? A: While being sworn into the Senate, the former first lady could expect her family to make headlines. However, it was Clinton&apos;s bright blue suit (which Roll Call noted matched her husband&apos;s tie) that made the front page. 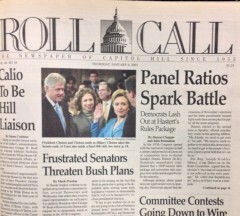 The Clintons made Roll Call&apos;s front page in 2001. Clinton&apos;s swearing-in suit was apparently exciting enough to make it into Roll Call&apos;s trivia quiz that week. 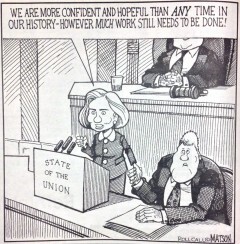 Q: Who was featured prominently in a political cartoon about the State of the Union address in 1998? A: You guessed it! The former senator and first lady. A cartoon published in the Jan. 26, 1998. 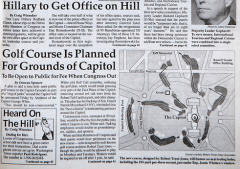 Q: As a part of Roll Call&apos;s April Fools&apos; edition in 1993, which first lady was rumored to be getting an office on the Hill? A: Clinton again! The article says the first lady, "whose trips to the Hill to lobby Members of Congress have achieved stunning regularity, will be given her own office space in the Capitol." Of course, eight years later she did have her own office on the Hill. The front page of Roll Call on April 1, 1993.